Give the toddlers in your care a head start on motor and social skills with this Adventurer Toddler Loft from Strictly for Kids. 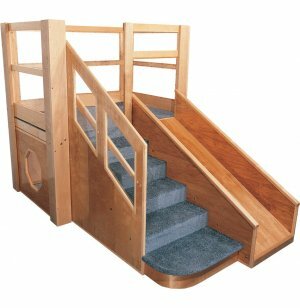 This beautifully constructed and full-of-fun loft features extra-deep toddler steps with handrail, a slide and a play space below that let little ones develop gross motor, turn-taking and imaginative play skills. 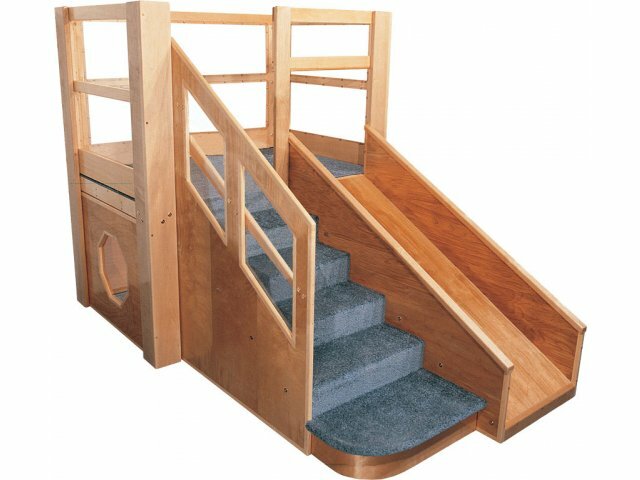 Crafted from solid maple and Baltic birch plywood with fully carpeted stairs and deck, this toddler loft provides daycare centers and preschools with lasting strength, durability and beauty. Features indestructible Lexan windows that keep children in full view of caregivers at all times. Ideal for ages 13-32 months. Exceptional Durability: Beautiful solid maple and Baltic birch plywood construction is unusually strong and highly durable.